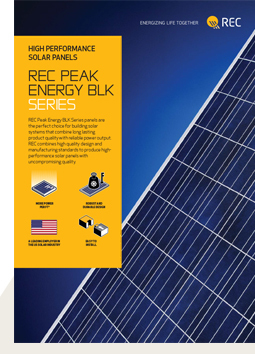 REC Peak Energy BLK Series modules are the perfect choice for building solar systems that combine long lasting product quality with reliable power output. REC combines high quality design and manufacturing standards to produce high-performance solar modules with uncompromising quality. The solar panels are easy to install with made-to-fit cables and multiple grounding points that reduce the ground wire needed in installation. Easy to lift and handle, the panels have a robust and durable design, supporting a large mechanical load.